I wasn’t be at the guild meeting yesterday, which made me sad. Kelly, of the Kelly bag fame, pinch hit for me with the officer gift bags. Thanks, Kelly. Many guilds give their officers quilts as thank you gifts. I am of the mind that we all have enough quilts, but a tote bag (simple or complicated) full of lovely small gifts is great for everyone. Since I organize it, that is what we do. When someone else takes over they can do something else. I cut the pieces on that last Sew Day then worked on my gifts the day after. The cutting is always the worst for me. There wasn’t much so I can’t complain. 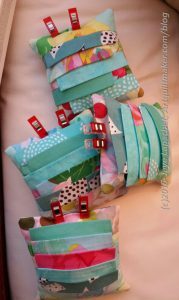 The sewing went remarkably quickly – so quickly in fact that I felt like making half a dozen more. 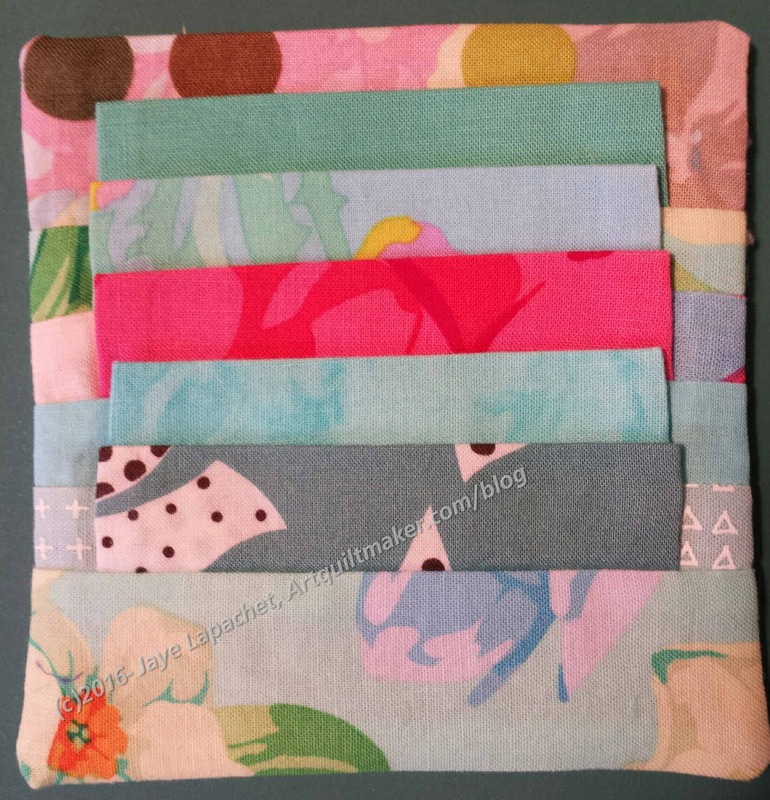 As I mentioned the fabrics were all scraps except for the back (5″ square). I made fabric by sewing selvedges together. I am tempted to do that again, but will try to resist saving another thing. The other fabrics are heavily from the Kaffe Collective, especially my man Phil (Philip Jacobs) and Martha Negley. I know these fabrics aren’t everyone’s cup of tea, but I hope the officers like them. The pattern says to line up the clip holders evenly, but I only did that for one. I thought the uneven rows would add interest, but I am not sure now. I used some of my Beanie Baby beans and some stuffing leftover from Red and Coral. I hope it is good enough for its purpose. The flaps you see are to hold Wonderclips (see photos above). My Wonderclips are holding the hole closed until I could sew it together. I plan to put a couple of clips and some pins in each one to show their purpose. Finally, I sent them to Kelly so she could put them into the bags for me. I found the pattern in Love Patchwork and Quilting, issue 39. It is available digitally in the Apple and Google Play stores. It was a quick and satisfying project. I was able to make four of them in about an hour minus sewing the stuffing hole closed. I think this will be on my list of small gifts to give to people for whom I want to make a quilty gift. LOVE, LOVE this project. I want to make some as I use the wonderclips all the time. Could you give more of a reference to where you found the pattern? Love of Patchwork and Quilting magazine has many issues. Check issue 39. It is available digitally in the Apple and Google Play stores. These are adorable and I wish I had a giant one (I have a lot of wonderclips). You sacrificed Beanie Babies to make these? A worthy use! No no no no no! No Beanie Babies were sacrificed in the making of these pincushions! The pellets are available in bags. Since many people are allergic to walnut shells I use a combination of Beanie Baby pellets (I am sure they have some other name) and wool roving for the filling on pincushions. adorable, I do believe I need to make a few of these too, i have clips everywhere and then when you step on them it feels like you stepped on a Lego! Cute idea. What a great gift. These were a big hit Jaye! I am so glad! They were fun to make and I think I will make some more. They were very popular, apparently. I wasn’t, unfortunately, at the meeting. Can I get the pattern please? I love these.